Hot August Nights cruise under the iconic Reno Arch. These are not your typical restored cars, some of the owners have spent upwards of a million dollars to get these cars to a competitive level. New name, same prestige. 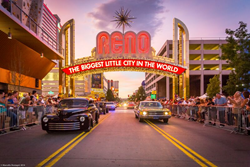 The Hot August Nights Cup presented by Downtown Reno makes its debut from Wednesday, Aug. 3 through Friday, Aug. 5 at Hot August Nights' 30th anniversary event. Replacing the previous year’s award, the Hot August Nights Cup offers more than $100,000 in cash and prizes—including a prize purse worth $41,720 for the Ultimate Best of Show Winner—making it the largest prize purse of any collector car competition in the world. The Hot August Nights Cup brings out the cream of the classic car crop to compete in a three-day Show-n-Shine in downtown Reno. Attendees can see classic engineering at its finest when 50 of the world’s top restored and modified cars compete on 4th Street in downtown Reno. Three renowned judges are faced with the challenge of narrowing down the field to the “Top Ten,” including Co-Host of Spike TV show “MuscleCar” Steve Mank, Co-Owner of nationally recognized car show the SuperNationals Reggie Tibbets and Eddie Potestio of Eddie’s Rods & Customs. The “Top Ten” qualifiers will be selected in downtown Reno at 3:30 p.m. on Friday, Aug. 5 and then displayed at the Hot August Nights Auction presented by Motorsport Auction Group, inside the Reno-Sparks Convention Center, on Saturday, Aug. 6 from 9 a.m. to 4 p.m. From there, the top five finalists, also known as the “Reno Five,” will be taken to downtown Reno and announced from 4th and Virginia Street at 6 p.m. Hot August Nights, a nonprofit organization, is the world’s premier classic car event, annually drawing hundreds of thousands of spectators and participants to northern Nevada to revel in nostalgia, enjoy top entertainers from the ‘50s, ‘60s and ‘70s and participate in a variety of events including Show-n-Shines, controlled cruises, an auction, drag races, and more. For more information, call (775) 356-1956 or visit hotaugustnights.net. For the latest updates on Hot August Nights, visit Facebook.com/HotAugustNights or on Twitter @HotAugustNights.